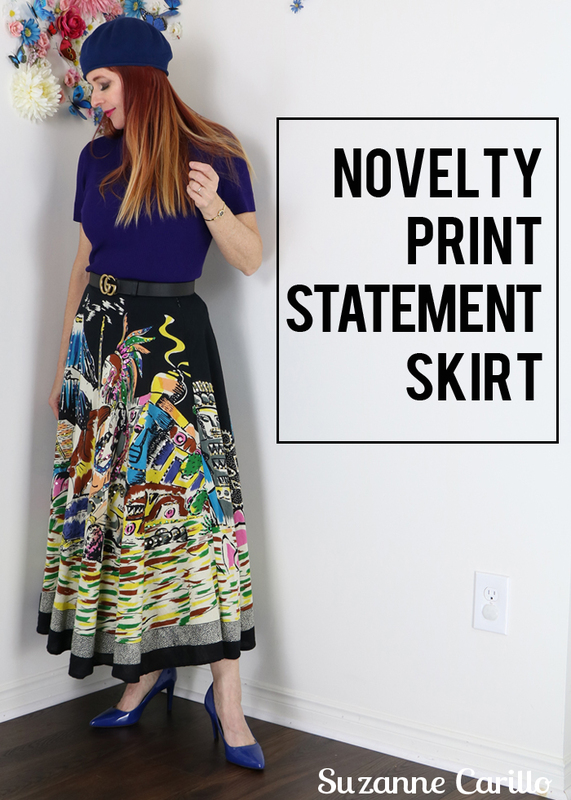 Vintage novelty print statement skirts are big business and can sell for large amounts of money depending on the print and the year of the skirt. A 1950s one-of-a-kind handmade piece with an image of an artist’s studio in Paris. I recently discovered another novelty print statement skirt when thrifting, can you tell how excited I was to find it? It really is like wearing a piece of art. I think the image depicted is Aztec. You can’t really see here but it has sequins on it as well. Two other pencil skirts came out of my closet and made room for this comfortable full flare skirt. All items purchased secondhand except the shoes and hat which are about ten years old. With all the thrifting I do for my shop my wardrobe is constantly changing. A bit like the weather around here…last week it was snowing, today it was 15 C and sunny and now tonight there are thunderstorms and rain. A bit like my style. Tonight I’m in jeans, tee and a hoodie, tomorrow I’ll be wearing a faux leather asymmetrical skirt, boots and a classic sweater and the next day I’ll probably be wearing a vintage maxi dress. My style is all over the place which isn’t ideal for personal branding but it is perfect for my creative brain. It keeps things interesting right? A large part of the diversity of my wardrobe is due to purchasing items secondhand. Shopping thrift stretches my style creativity. It is an opportunity to try out new ideas without breaking the bank. I know I tend to repeat myself but honestly if I can get one more person to consider buying secondhand over retail it is small step in the right direction for the environment. Small choices amount to big changes for our world. Are you a fan of novelty print skirts? I think it’s a good broken record message, Suzanne!! There are just SO many wonderful items that have already been made and need a good home. It’s like rescuing a pet….who rescues who is always the question. 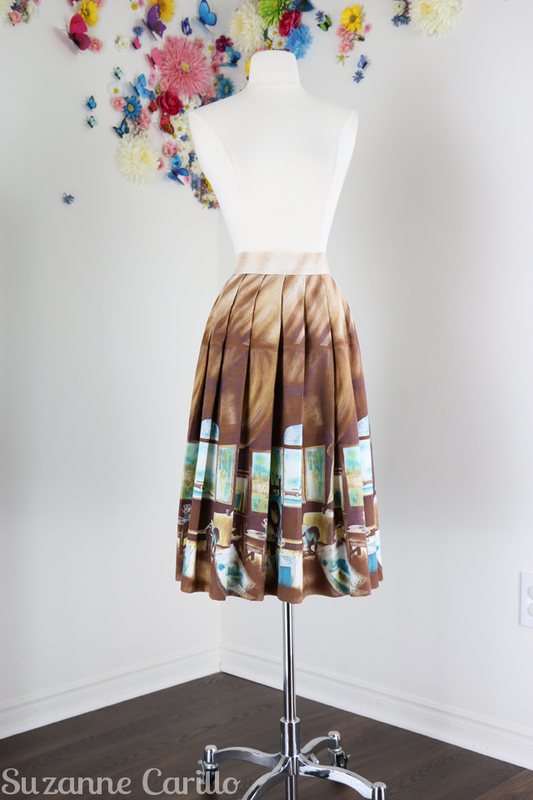 And I think I have more print skirts than I do solid ones….especially for the spring/summer. Not that I can’t wear them for the winter too, but that’s how they are categorized in my brain… #sillybrain. I’m surprised to learn that your print skirts are allocated for spring/summer. You are always showing different ways of wearing items in different seasons. OMG, the Aztec skirt – it should be in a museum (or my closet : >). Srsly, that is one fine skirt, a treasure you rescued from the second hand store! I think statement skirts like these three inspire even more creativity, like the pairing with your Gucci belt and a beret. I agree that creativity inspires more creativity. 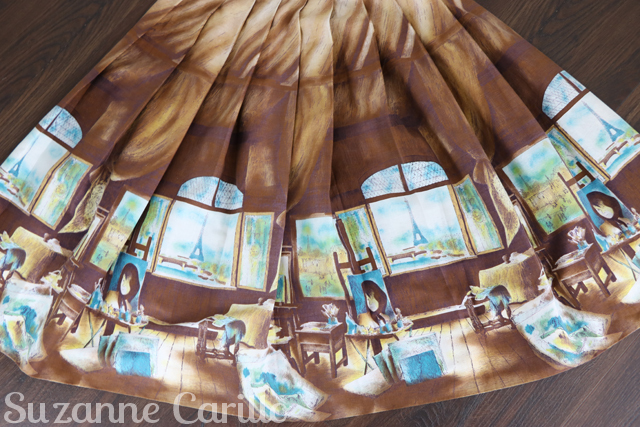 Just like the skirt you are wearing on your blog today it is wearable art. 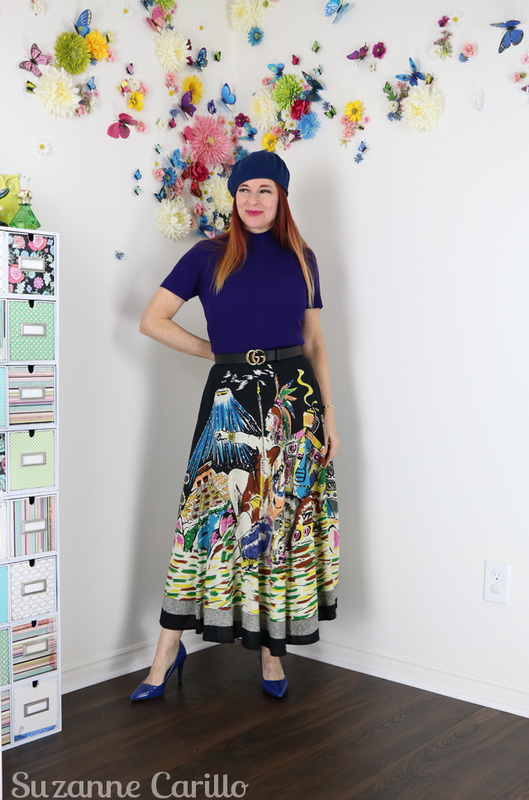 i looove novelty print skirts! but they are hard to get around here – or expensive on the internet…. i had two perfect ones from the 50s in my teens, i wore them to bits – and now i have so many skirts (many printed) and esp. the full, cosy category i can sew within 2 hours. your skirts here are fabulous and you styled them perfectly! so chic!! 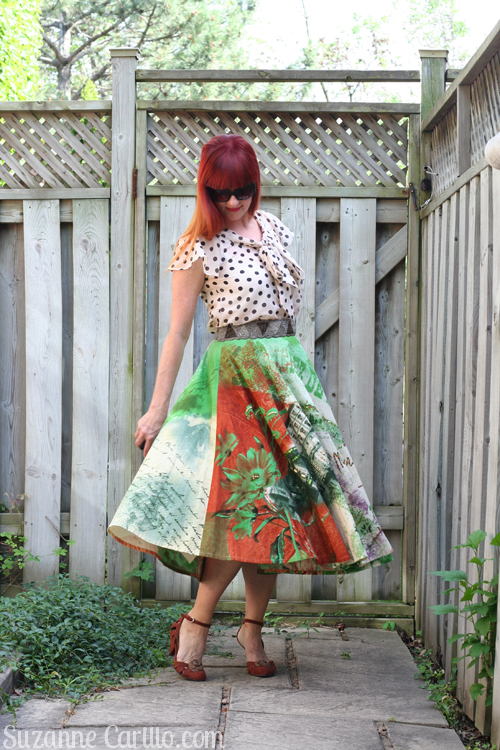 I’m totally in love with these novelty print skirts, so fabulous pieces and you rock in them!! Gorgeous!! 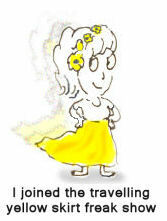 Glad that you’re enjoying so much all the diversity and fun which come with secondhand buying!. That’s fabulousness! I agree, who knows what treasures are waiting to be found on my next trip to the thrift store? That skirt is fantastic – tell me about it. Where was it made? Is it a souvenir piece? I’ve got a few photos of my Mum in novelty print skirts taken in the early 1960s – there’s one with poodles, another with Greek urns, one with scenes of Venice and another featuring postcards from Paris. I’ve found a few in the past and they do sell well – despite the tiny waist sizes (Britain had only just stopped food rationing and we were all a lot smaller). I wish I knew more about the skirt Vix. There are no tags in it. I agree with you and Jon. 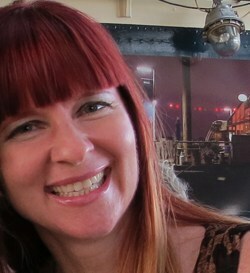 I often think I’ll wear a piece until I feel ready to sell it and pass it on to someone new. Very cute. There’s a boutique in my town that sells these — for a lot of money. I’ve been tempted but the price always stops me. I’ve never seen one in a thrift-store. Given your pro thrifting skills and effort, you’d be the first to discover a gem. That is very interesting there is a boutique dedicated to these types of skirts where you live. I wonder if they are reproductions or authentic vintage? I had a few……cheap ones from Chinese shops. Yeah I know, I don t buy that anymore! And Inever understand ,,signature style,,. Sounds boring to me. Ha ha! I agree! I don’t want to look the same all the time. I agree that often these have very small waists. I really didn’t think this one would fit me so it was a wonderful surprise when it did. I’m sure you will eventually find one Ann. The shops you visit seem to have some really great pieces. Do you ever leap gleefully down the aisles and giggle uncontrollably in the thrift store where you’ve scored these unique treasures??!! These skirts are far more than just interesting and novel and you’re giving them the love they deserve. Well I can tell you I snap them up and shove them into my cart very quickly. The thing I’ve learned about thrifting is never to let on you found something fantastic until you’ve left the store…then you can dance and giggle all you like. Yes, I am and have never seen any like the two you show above on my thrifting excursions – or at least not in my size. They’re such fun! I do find the flared, circular type skirt difficult to wear because of my ‘spare’ tyre….I have a yellow patterned knee length one and am jiggered as to what to wear on top of it. I have several jackets I could wear but need something underneath the jacket that doesn’t just emphasise the flab! I agree that this type of skirt can be difficult if you carry extra weight in the tummy. I often wear Spanx when that is an issue. I was lucky with this one because the print is so vibrant it camouflages any kind of lumps and bumps. I certainly do get the feeling I listed it too cheap. It is hard to find the sweet spot, being able to move inventory and still be viable. Well, you learn and next time you will probably ask a bit more. Oh my goodness, what an amazing skirt and of course, you have to keep this beauty to yourself! I love how simply you’ve styled it – absolute perfection! And it shows off your figure to perfection too, hurrah! I don’t think large brands are dealing with sustainability issues in an appropriate and timely manner. There isn’t enough pressure when the public keeps buying from them. There are smaller companies that have started to really work on this but the large fast fashion houses are too entrenched in their current ways of production. It is only when consumers choose to no longer shop at these stores and demand that their governments tax and fine the companies for pollution and unsustainable business practises that we will see change. Yes your style is a little all over the place in the best kind of way. I truly adore these printed skirts. They make the argument for high-quality artisan prints ! You can find them today but they will cost you $1000! For similar quality, LOL. Yes, the weather. Up-and-down and up-and-down again. We seem to be stuck with some cooler temps and grey skies for now. Oh…just another FOUR MONTHS of this! Ugh! That skirt is a beauty and I’m glad it’s staying in your closet. 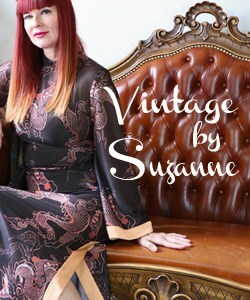 I used to come across the occasional vintage circle skirt in a thrift store (never in my waist size, mind you) , but now they are snapped up by vintage sellers, who, as you say, sell them for significantly higher prices. The thing I love about your style is that it is so creative! I never know what you are going to be wearing next- and I love that! That novelty skirt you found is lovely- and I’m not surprised the other one sold in 5 minutes either!